台灣唯一常態性演出黑人音樂的爵士原力黑樂團 515大河岸拉丁騷動聖堂黑樂夜準備嗨翻天 Latin Funk Night of TIJEPA Jazz Groove Band on May 15th at Riverside Live House Ximen! Checking Out "Don't Stop 'til You Get Enough" Again! Latin Funk Night of TIJEPA Jazz Groove Band on May 15th at Riverside Live House Ximen! 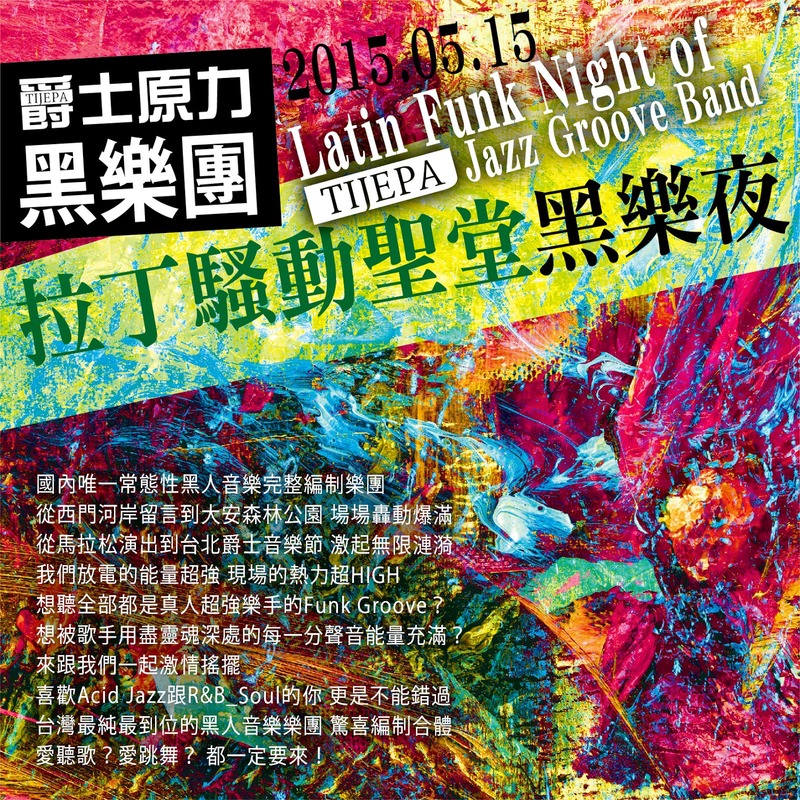 The one-and-only regular band that focus on Black music such as Funk, R&B, Soul, Hip-Hop and Acid Jazz... exclusively in Taiwan - TIJEPA Jazz Groove Band is going to give the 5th grand performance - "Latin Funk Night of TIJEPA Jazz Groove Band” on May 15 at Riverside Live House at Ximending, Taipei City! 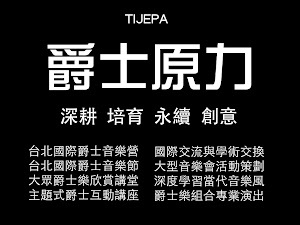 TIJEPA Jazz Groove Band was coached by veteran Taiwanese jazz musicians Chi-pin Hsieh & Kai-ya Chang, who also do the arranging and organizing as musical directors of the band and TIJEPA. Most band members knew each other from the annual Taipei International Summer Jazz Academy, and work professionally throughout Taiwan. 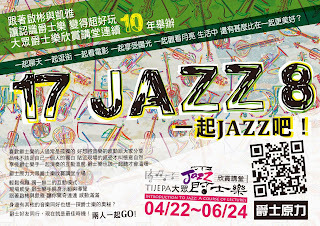 Every week we gather together for rehearsals in Taipei, not only working on the groove but also on the better jazz chops since 2013, and already gave big concerts at Taipei International Jazz Festival, Concert Venues in Taipei and Outdoor Stage in the South, gained positive feedback from the audience and music lovers who addict to groove kinds of music. The band consists of 20 members including brass section, string section, woodwind section, 3 guitarists, 2 keyboardists, bassist and drummers and percussionist one for each, there are 4 singers in the band so that they sing the lead and take gospel-like chorus by turns. 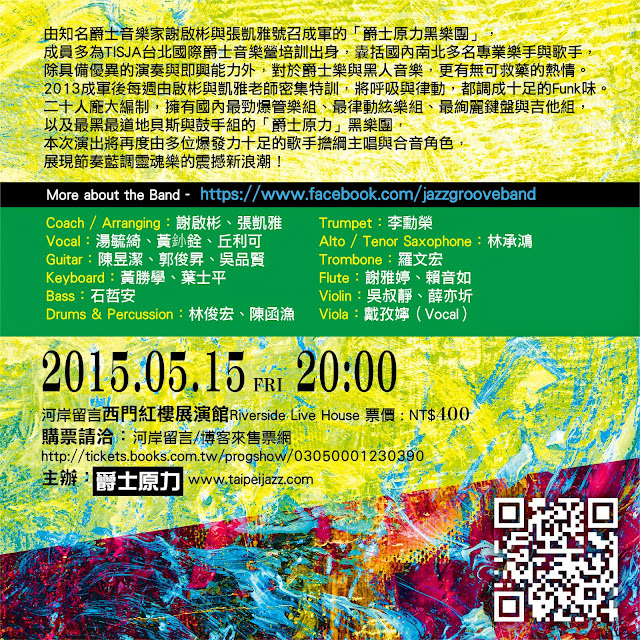 It’s very rare to see a local Taiwanese band with such large scale, and concentrate on making greater Grooves! The 5th grand performance on May 15 will be a theme on Latin Funk, besides music of Bruno Mars, Beyonce, Michael Jackson, Stevie Wonder, George Duke, there will be classic groove music like the music of Jamiroquai, Incognito, Earth, Wind & Fire, Tower of Power, Kool & the Gang to be interpreted. Come to listen and dance at the same time, enjoy the night!